Allison has shared how she uses Kaboom shower, tub and tile cleaner in her home, not only in her bathroom, but also in other areas of her home. If you want a product that does it all, then get yourself Kaboom shower spray. I have used all types of products, and this one works without a lot of scrubbing. I usually spray it in the bathroom, then leave it and go into the kitchen and clean with it there too. In the kitchen I use it on my stove top, and to clean the outside of my appliances, like my fridge. Then, when I'm finished cleaning in the kitchen I go back into the bath and it is a very easy job awaiting me. In the bathroom I use it to clean my bathtub, shower, sink, tile floor, and the toilet. For the toilet I pour some Kaboom into it and close the lid, and it stays until someone uses the wash room. It smells good and the scent lingers for a good while, making the room very pleasant. Meanwhile, using Kaboom in this way I've cleaned the kitchen and the bathroom, and I am not even tired out, and my cleaning time is literally cut in half. have many copper pans and decorations, and in the past they have been very difficult to keep shiny, but not any more. Now I just spray it on the copper and watch the tarnish just go away. I am not talking about scrubbing for an hour, I mean just watch the shine appear. Thanks Allison for sharing your uses and review of Kaboom shower, tub and tile spray cleaner. I just want to comment about two things you said, for other readers. First, letting a cleaner soak in the toilet is a quick easy way to clean it, and also quite effective. However, for safety reasons only do this in a house with no small children or pets, since they may not understand not to "partake" of the toilet water full of cleaning chemicals. In addition, Kaboom shower cleaner is advertised to be safe for stainless steel, but nothing is mentioned about copper. Therefore, if you try Allison's tip make sure you first test this cleaner in an inconspicuous location to make sure it does not harm the copper before you clean with it! Has anyone else used this product to clean their bathroom, or other parts of their home. You can share your shower cleaners review here, or read other reviews already submitted. In addition, you can share your bathroom cleaner review here for this or another brand, telling me what you like, or don't, about it and why. Diane has shared her review of Kaboom shower cleaner. I have really hard water and also this disgusting black mold/mildew that seems to keep coming out of my wall no matter how much I clean. I think it has something to do with the pipes or the grout or for all I know my house is possessed and there is a hellmouth located below my foundation. I've tried scrubbing bubbles, Lysol, and CLR all with little to no success. My mom lives in the south, where they have so much iron in the water it turns their bathtub and sinks orange over the course of a few weeks. She told me about Kaboom shower tub and tile cleaner and I decided to give it a shot. It works, and it works well. It is better than most of the cleaners out there, but it has 2 drawbacks I have found. First, the sprayer is sub-par, it takes a lot of effort to get what you need out of the bottle, and after cleaning I find I have a painful dent in the pad of my finger from having to work at it so much. Second, the price. Where I live, Ohio, Kaboom is easily twice the price of the competition sitting next to it on the shelves. Solution? Big Lots. They have it on discount once in awhile and if you can get it at a close to competitive price, it is worth it. I'd say that my cleaning time is the same with Kaboom (no magic here, you still have to scrub) but I have to do it about half as much as with the other products I've tried. All in all, give Kaboom a shot, you won't be disappointed, but your finger MIGHT hurt the next day. Thanks Diane for your review and critique of Kaboom shower, tub and tile cleaner. Has anyone else used this product for mold and mildew? I know that Kaboom makes a product, called Kaboom Stainbuster Mold and Mildew Stain Remover, which I've received a couple of reviews about on this site. If you've got a significant mold problem, you may want to check this product out too, or one of the other mold cleaners on the market. Majorie has shared her opinions and experiences with this product. I cleaned my shower with this product, as well as my bathtub. I purchased this Kaboom cleaner from the official Kaboom website in an effort to make my shower smell fresher, and to clean away hard water stains. I also bought it to clean away soap scum from my bathtub, since it seems to get built up, along with grease. The tub just looked so dingy and grimy! When I got the product I immediately decided to use it, and sprayed it in my tub. I got a sponge, and was surprised at just how quickly it took away the grease and grime that once made my tub look completely nasty. It looked so much better. I then used the product in the shower of my downstairs bathroom, and it cleaned the hard water spots from the shower walls and door. The shower looked so much better as well. This product is a little bit more expensive than Lysol and Tilex, but it works so much better. I also found that I really liked the way it smelled, and it didn't make my hands burn when I was cleaning with it. I would recommend it to anyone who needs to clean their tubs and showers, especially in our community with all the fracking that is going on. Thanks Marjorie for your review of Kaboom. Does anyone else notice a difference in how they need to clean their home if you live in an area with fracking? If so, please share your tips for cleaning, or observations of how it is different now, here. Dara has shared her opinion about this product. 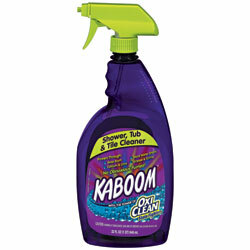 I used the Kaboom shower tub and tile cleaner a few weeks ago to clean my bathroom. I purchased the product after seeing an online advertisement for it with a coupon. It was easy to find in the store because there was a large display at the end of the aisle with several Kaboom products. The cleaner worked reasonably well, but had a very strong chemical odor. It also did not work quite as well as the cleaner that I usually use (Scrubbing Bubbles). The chrome parts of the shower were not as polished as I had hoped they would be when I finished cleaning, and I actually had to use a different cleaner to get it to look the way I wanted it to. In addition, it caused some mild spotting on the shower, which cleaned up fine using the other cleaner. I was extremely disappointed with the performance of the Kaboom cleaner given its retail price, which was higher than most other cleaners in its class. Overall, I was unsatisfied and would not purchase this product again. Thanks Dara for your review of this product. It is interesting that you comment on Kaboom's odor, because one of the things Kaboom advertises about its products is that it doesn't have "obnoxious fumes." I think some people (me included) are more sensitive to odors and fumes than others. I would be interested to hear what other people who have used this product have thought about it, especially the scent. You can share your review here, telling me your thoughts and opinions. ***Update - Someone wrote in a question, saying they liked Kaboom products, but that the fumes were almost suffocating. Here is the whole question, and my response about suffocating with fumes from cleaning products. Obviously, many people feel that Kaboom products don't live up to their claim about the lack of "obnoxious fumes!" Jennifer has shared her experience with Kaboom spray shower cleaner. I have tried other Kaboom products and was satisfied with how well they clean, so I decided to try the shower tub and tile cleaner. However, I was not happy with the results of how it worked on cleaning the bottom of my fiberglass shower enclosure. It only removed a small fraction of the stain that was created by my shampoo and conditioner bottles, which I keep on the shower's fiberglass floor. It also did a very poor job on the glass doors inside the shower enclosure. After I finished cleaning the shower doors the glass still had water spots on them, and the product left streaks. I tried using it on more than one occasion and got the same poor results each time. The smell of the product was not bad, and I did not have any allergic reaction to it. But overall I was not satisfied with how it cleaned my shower, and I would not buy this product again. Thanks Jennifer for sharing your experience with this product. I am always looking for more reviews from people who have used this product before. You can share your shower cleaners review here, or read other reviews of other products that have already been submitted. I first bought this product after seeing commercials for it on TV. I am always willing to try new cleaning products, and this one came out right as my family was moving into our home. The previous owner had moved about 8 months prior, so of course there was a lot of cleaning to be done, especially in the bathroom. The tub and shower walls were covered with dust, dirt, and clumps of hair. I expected to clean the areas at least 3 times to get everything off, but Kaboom shower tub and tile cleaner took them all off the first time. I have since thrown out the other cleaning products I had for the tub and shower, and haven't regretted it. Kaboom cuts right through any dirt, no matter how long it's been there. I have often recommended it to other people. Thanks Shelly for your review. As you can see I've gotten lots of reviews of this product, some positive and some negative. I would love to keep hearing from people who have used it to share how it has worked for you. You can share your review here, for this or any brand, telling me what you like or don't about it, and why. In addition, you can read reviews of other brands which have already been submitted. In addition, you can share your bathroom cleaner review here, for this or another brand, or read other reviews already submitted. I agree with the reviewer that the sprayer is sub-par, probably below sub-par. Please tell the manufacturer to redesign this sprayer. I would rather have a sprayer that doesn't foam the cleaner and doesn't required squeezing it a dozen times to get enough cleaner on the surface.